Weave twists are like 2 strand twists that is normally achieved by twisting your synthetic extension and thin natural hair. 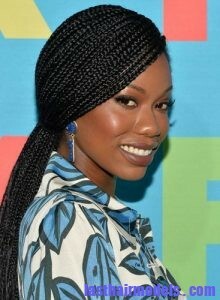 You can also create this look by using the braid extension on a thick natural hair. Once your twist the extension and natural hair in this way, it is possible to create strong 2 strand twists that will look like a single braid that can stay in place without any touch-up for2-3 months. First clean your hair and brush it as usual with rat tail brush. Then divide the hair like box-shape and divide it again into 2 different parts. Hold the hair with your hand near its root and try to twist individual hair section to create the coil. Avoid twisting more than one section at a time as it can make the styling process difficult. Next cross your coiled hair over other section and start twisting your individual hair sections again just like before. Continue this process till end of the hair. Use the same method on other parts of your hair all over the head and dip the hair ends into the bowl of hot water to end the styling process. You can either use Kanekalon synthetic extension or Yaki extension for braiding your hair in this way. Try to massage the scalp with oil at least 2 times in a week to maintain the twists properly and cover the head with silk scarf before going to sleep in the night.